Post South Loup Fork "Fort Banishment"
On the South Loup River southwest of here was the site of the U.S. Army's Post South Loup Fork. This small outpost of Fort Kearney was established in May 1865 by Company "E", Seventh Iowa Cavalry, under the command of Capt. Jams B. David and consisted of a log barracks and stable enclosed by a sod wall. The post monitored the movements of Indians in the Loup River valleys. Sometimes it was called Post Connor in honor of Gen. Patrick Connor. In July 1865 the Iowa Cavalry was replaced by Company "E" of the First Nebraska Cavalry and in August the post was abandoned. In 1871 pioneer settlers from Gibbon used the log buildings for firewood. 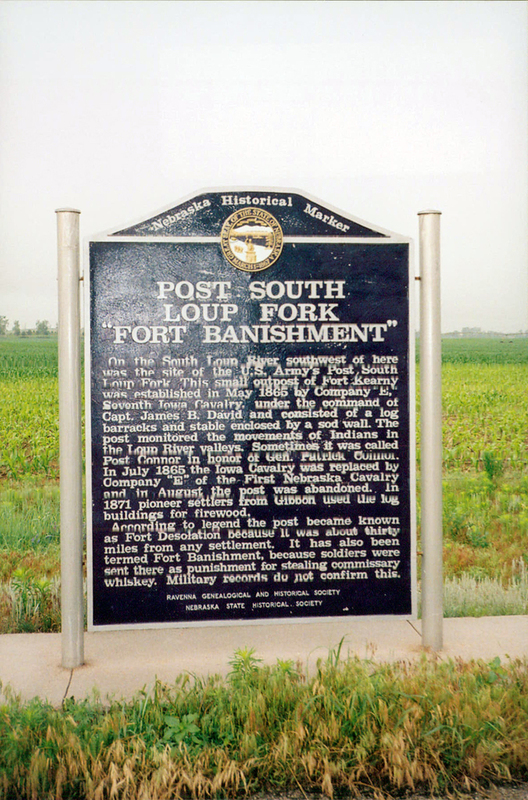 “Post South Loup Fork "Fort Banishment",” Explore Nebraska History, accessed April 19, 2019, https://mynehistory.com/items/show/39.